This cooper narrow bracelet has assorted abstract stamping. 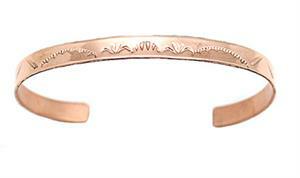 This bracelet measures approximately 1/4" wide and is made with 18 guage copper plate. Native handcrafted by Navajo artist Gwendolyn Tahy. Stamping will vary.